7x10 B click displays letters, numbers, and characters in a 7x5 font resolution. It carries a matrix of 70 blue LEDs driven by a pair of 8-bit serial-in, parallel-out shift registers, a Darlington Transistor array and a Johnson counter. The click communicates with the target MCU through the mikroBUS™ SPI interface (SCK, SDO, SDI), with additional functionality provided by R CLK, MR#, LATCH and R RST pins. 7x10 B click is designed to use either a 3.3V or a 5V power supply. 7x10 B click is essentially a dual character display capable of showing letters, numbers, and characters in more readable typefaces since the 7x5 resolution is the standard one for displaying ASCII characters. 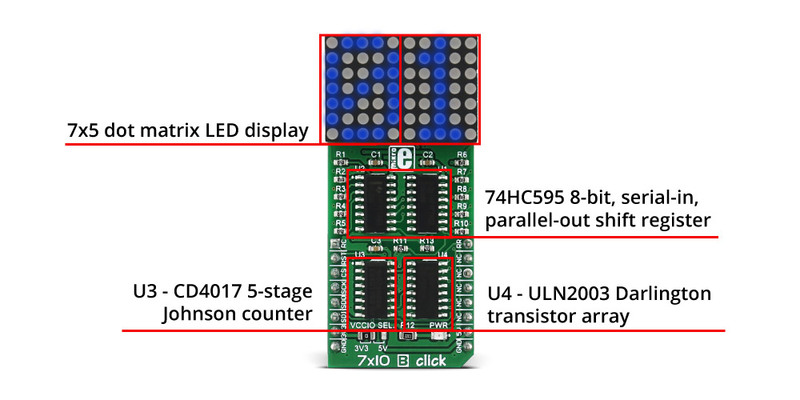 This type of resolution is more readable than the 14-segment display.